Every time the Safeway checker asks the person in front of me if they play Monopoly and they say no, I consider shouting, “I’ll take their tickets!” But the last shred of human dignity I’m holding on to stops me, and I simply take the tickets I earn. Because Safeway Monopoly is thrilling. To those of you not playing, Safeway Monopoly involves a large square Monopoly “board” and then you get Monopoly tickets based on how much stuff you buy at Safeway. Tickets contain game pieces, which you try and match up to your board to win prizes, and all tickets either contain teeny tiny coupons or codes you can enter online. Right now, everyone playing Safeway Monopoly is one game piece away from winning every prize, from the $5 in free groceries to million dollar grand prize. Everything is branded up the wazoo, naturally. Rare tickets include an instant win – usually in the form of “Two free tickets!” but in our exciting case, we won a free bag of chocolate and a free can of baked beans. My honey and I will sit at the kitchen island till 2am working on our Monopoly board, discussing life and jumping up and down over the free beans. I was so excited about the beans, I instagrammed a photo of our win and used the hashtag, #safewaymonopoly. 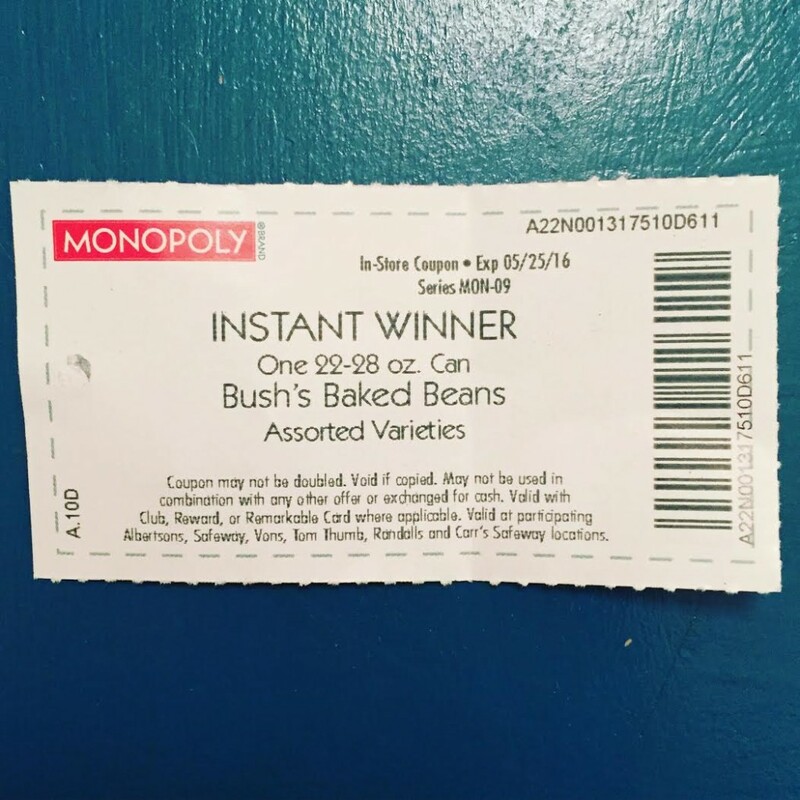 Lo and behold, people are using the #SafewayMonopoly hashtag to trade tickets! People are of into the Safeway Monopoly racket that they are offering to go splitsies with anyone who has game piece Z8634D. Somehow my excitement about the beans is totally normal, but going public with a call for tickets seems ridiculous to me. First of all, it’s asking for trouble – legal trouble when this all inevitably goes terribly wrong. And also, is this even allowed? I went online to explore the complex Safeway rules. There’s no mention that I can find about public calls for game pieces. I remain fascinated by the lengths some are going to win at Safeway Monopoly, and with only one day left to collect game pieces, hopeful that the vacation house (or as it’s described in the fine print, $500,000 that you don’t have to use on a vacation house if you don’t want to) will be mine! Good luck, fellow Safeway shoppers.